ASSAM, INDIA – BRITISH COLONIALISM, 1940s: On a “delicate and ephemeral” spring day of “golden rain” in 1943 Colonial Assam (a northeastern State in India), we are introduced to a delicate beauty and enduring female voice: 17-year-old Layla Roy from Silchar. She has been lovingly and non-traditionally raised to have choices and a fine education by her esteemed, scholarly, independent, and endearing grandfather, Dadamoshai; and she has fallen in love with Manik Deb, a civil servant and Rhodes Scholar from Oxford. This is a book with a soul. The story is packed with lush descriptions of exquisitely fertile scenery – banyan trees and tamarind trees and mango trees and Gulmohor trees – and some of the richest, most diverse wildlife in the world – Asian elephants and languor monkeys and Hullock apes, a part of the world few of us have probably ever seen, until now. This is also historical fiction about the remote, grueling, eccentric, and, at times, wildly dangerous Assam tea plantation life that few of us may have even heard of (I surely hadn’t until now), set during a complex, volatile, patriotic time in India’s history after being ruled by Britain for 200 years. India in the 1940s was a complex mix of cultures, social classes, languages, and customs, making this an impressive undertaking even for an author raised on an Assam tea estate. The only thing richer than the sumptuous, lifting prose would be to join Layla, Manik, and Dadamoshai, who we come to know and immensely like, on their verandah reading while sipping a cup of Assam’s world famous tea, or meeting the colorful characters who inhabit the Mariani’s Planters Club at the Aynakhal Tea Estate (“Aynakhal” means “Mirror Lake”). At 427 pages, I wished Layla and Manik’s story continued. Perhaps it will, because I read on Shona Patel’s lovely Tea Buddy blog, complete with real photos of Assam tea bungalows, that she has garnered a 3-book contract (congratulations! ), so maybe Layla’s story will continue through the years, after India achieves its independence (Book 2?) and into today’s times (Book 3?). We can only hope so! I luckily stumbled on this book at NYC’s BookExpo America (BEA). I was waiting on an autograph line for an acclaimed author I had identified, having done much research ahead of time to make the most out of the hectic yet exhilarating Javits Center experience I annually look forward to, when I noticed a much longer line to the left of me for an author whose name I had not recognized or seen advertised. 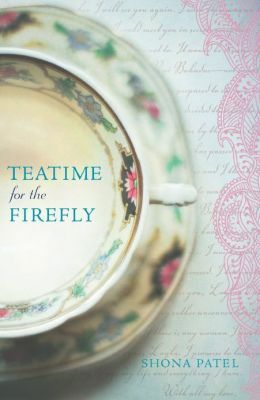 I quickly found a place in Shona Patel’s enthusiastic line, which is how I obtained an advanced signed copy of Teatime For The Firefly. If you are curious about the precise meaning of the title, you can hear this gifted author share her thinking in a short video on her blog. Just as Layla wonders: “How can I ever forget my first sight of a tea plantation?” you may wonder how you can ever forget her coming-of-age story. I’m so glad you met Shona and read her book, Lorraine. It is a great representation of life in Assam on a Tea Estate. I’d like to think there may be another book just round the corner??? Many thanks Lorraine for your detailed and thoughtful review of Teatime for the Firefly. It’s immensely gratifying to know you have walked through the pages of my world and savored the journey. No author can ask for more and thanks for spreading the word.